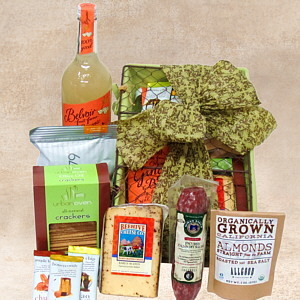 Give thanks to friends, family and Mother Earth with this artisan gift filled with organic and hand crafted food. Open the lidded wire basket to reveal Organic Ginger Beer with real root ginger, Beehive Barely Buzzed Handcrafted Cheese (rubbed with coffee, always a hit), Organically Grown California Almonds, Urban Oven Olive Oil Crackers, Niman Ranch Italian Dry Salami (no nitrates, sustainably and humanely raised), 479 Organic Ginger Sesame Caramel Corn and three Chuao Chocolate bars: Honeycomb, Potato Chip and Maple Bacon. A thoughtful and sustainable gift that uses very little packaging and offers a container that will continue to be used for years to come.